Unfortunately, I had an awful day today I just wasn’t feeling well, the weather was kinda ugly, and there was just too much to deal with at school. I hope you guys like gray colors, because my nail polish is definitely reflects my mood today. 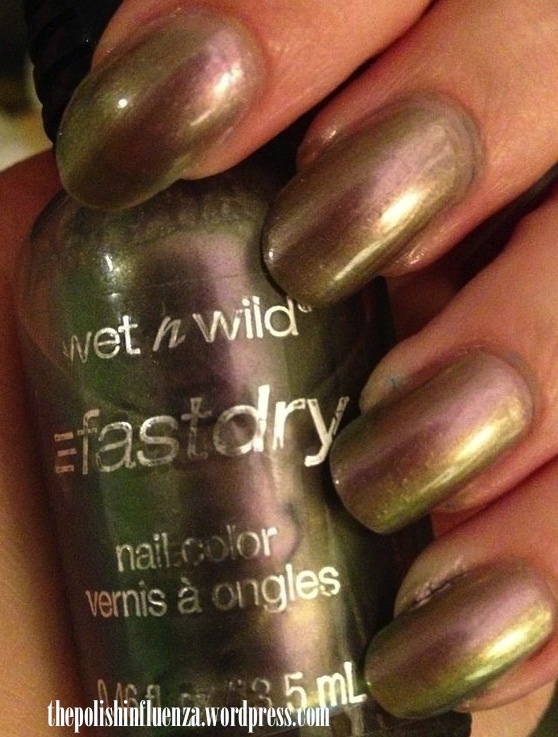 Wet n’ Wild Fastdry in Gray’s Anatomy is my color of choice today. 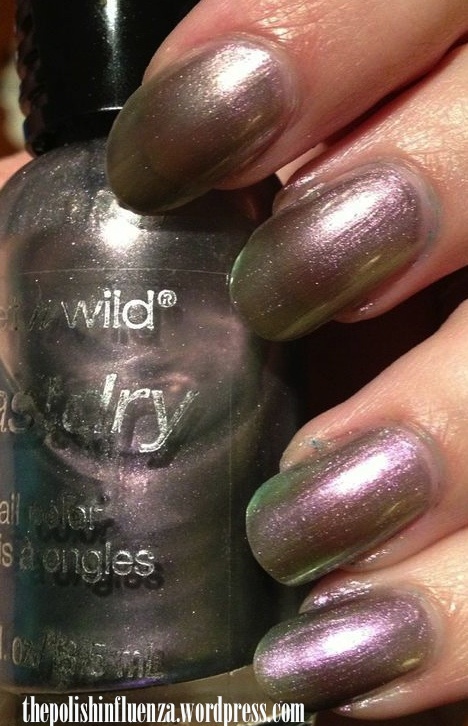 It’s a shimmery muted silver, but has a green and purple/red duochrome to it depending on the light. While it is a bit of a “washed out” color, it really is an amazing sheer. It looks like it would be a brushstroke nightmare, but it actually self-levels really well. It’s opaque enough to wear on its own in 3 coats, but VNL is still an issue, just not a major issue. And, um, it’s not really fast drying… I just nicked a nail typing this and I’ve had it on for 30 minutes. Oh well, I’m pleasantly surprised by this color. It’s been in my unused pile forever and I’m glad I finally tried it! Pictures below are without topcoat. This color is a real chameleon- it changes color depending on the light. In the last picture, you can see some brushstrokes, but they aren’t that bad in real life, the camera just enhances them. Overall, I like this polish. What do you think of it, and have you had a better experience with the “Fastdry” aspect than I have? Let me know in the comments! Wet n’ Wild polishes retail for $0.99-$5 (depending on the line) and can be found at most drugstores (like CVS or RiteAid to name a few) or on their website here. 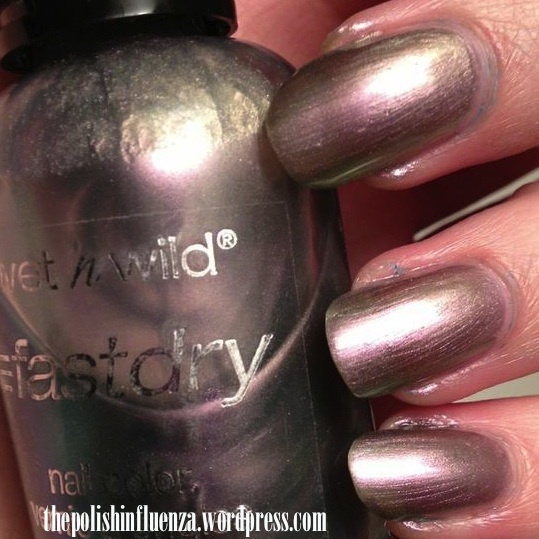 Categories: MOTD, Wet N' Wild | Tags: autumn, duochrome, fastdry, gray, green, MOTD, nail polish, pink, purple, sheer, shimmer, shine, Wet N' Wild | Permalink. I have the same polish and I didn’t have any problems. I waited about 2 to 3 minutes between layers. I also used very thin coats. 3 was enough for opacity. Hmm… I wonder if it’s because my polish is over a year old. Maybe that’s causing formula issues.